The tranquil setting of Hauser & Wirth gallery in Somerset, England only serves to heighten the impact of its exceptional new exhibition, Louise Bourgeois: Turning Inwards. The gallery group has represented the icon for over two decades yet despite the palpable aura of permanence pervading the experience, this is the first time her works have appeared here en masse. The intoxicating show is centred upon 38 soft ground etchings made by Bourgeois in her home studio during the final years of her life (2006-2010). Throughout this prolific late period, the artist created intuitively; transfixing burgeoning ideas and prominent memories (joyous and troubling) onto copper plates (with the occasional addition of watercolour, pencil or ink) so that reinterpreted recollections and fresh experiments could intermingle for eternity in these resonant pieces. And a few indomitable sculptures appear in the generous mix too. Themes hardly need spelling out as Bourgeois’ works communicate so openly, at times seeming to radiate their intentions and questionings directly into bodily consciousness. 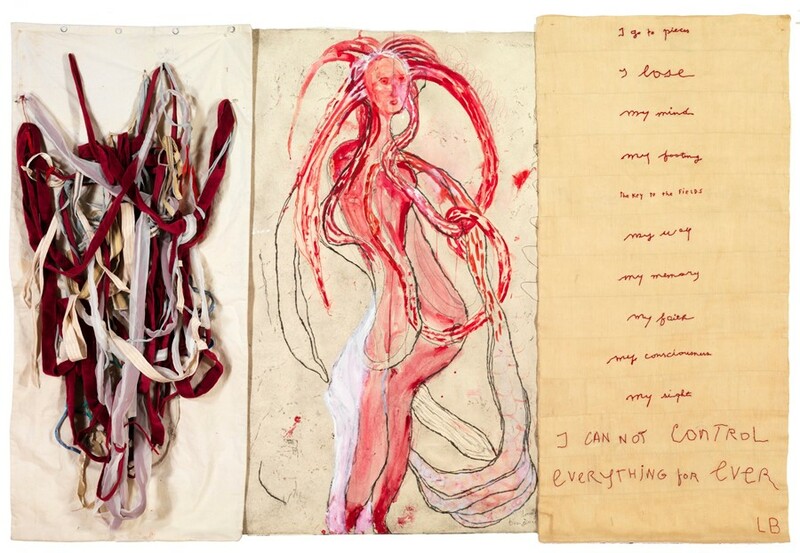 All the same, those familiar with the erudite artist’s oeuvre will spy familiar, recurrent threads and motifs tethering the images, materials and fragments of text together, such as femininity, botany, sexuality and family. The deftly curated journey begins in the gallery's Threshing Barn, in subtle gloom, where the viewer is dominated by a giant, bronze spider – aggressor and protector. Just beyond, the first etching, The Nest, spins this juxtaposition into an evocative tapestry. Moving onwards into the light, intricate, fecund etchings in a restrained palette draw the eye, arousing thoughts of sexuality, ownership and the primal interplay of gender roles, as well as domesticity. 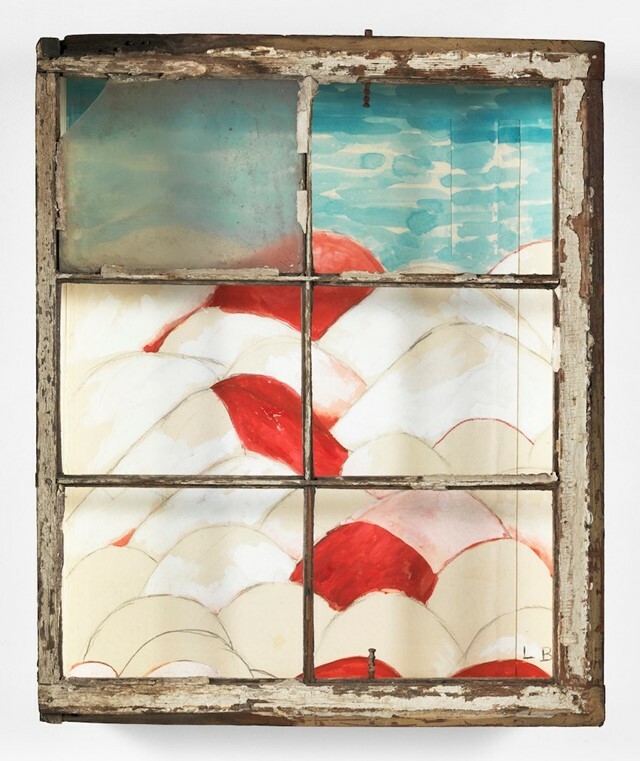 The latter is made explicit by the repurposing of an old window frame to encase My Blue Sky, a striking watercolour in vivid blue (escape) and red (insistence). In the Rhoades gallery, past the totemic, bronze Topiary, the botanical world blends seamlessly into the ripe, amorphous narrative spun thus far. The leaves within The Smell of Eucalyptus (#1) seem to undulate, vivacity amplified. But it’s the three Look Up! etchings in this room that command most power through their ambiguous organic, primal forms. The intensity is ramped up in the final room with further use of red, a hint of menace peeking through myriad disembodied eyes in I See You! and nail on wood sculpture Femme Pieu, and sorrow in Turning Inwards and Paddle Woman. This is also where we behold Bourgeois’ mental anguish writ bold via the inclusion of text in the beautiful I Go to Pieces: My Inner Life. The cumulative effect of Turning Inwards is extensive and does not waiver upon reflection: total saturation in the persistent, urgent flows and ebbs of life – holistic cycles unto eternity. Louis Bourgeois: Turning Inwards runs until January 1, 2017 at Hauser & Wirth, Somerset.